FC Barcelona kept their comfortable lead atop of the standings with a 2-0 victory over Girona in the Catalan derby. Barça’s Portuguese right-back Nelson Semedo gave the Blaugrana the lead in the lead in the ninth minute. Although Barça had the early lead, they still found it difficult against a gritty Girona side. 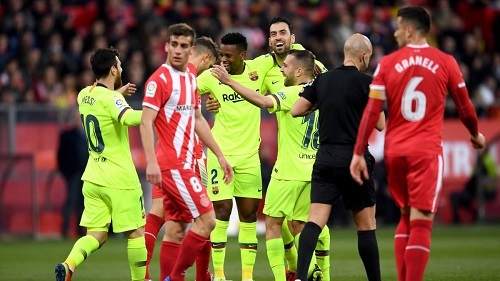 However, that all changed when Girona’s Bernardo Espinosa was sent off in the 51st minute after he was cautioned for the second time and Messi ended any hopes of Girona salvaging this game after he lobbed the ball over Bono for a memorable goal in the 68th minute. This was the sixth consecutive league match that Messi had scored and he now has 18 league goals. Barça still enjoy a five point lead over Atletico and will now shift their attention to Wednesday’s Copa del Rey encounter at the Camp Nou against Sevilla as they attempt to overturn a 2-0 first leg loss. Girona: Bono; Pedro Porro, Alcalá, Bernardo, Juanpe, Valery; Pere Pons, Aleix Garcia (Douglas Luiz, 69′), Granell (Paik, 85′); Portu (‘Choco’ Lozano, 80′) & Stuani. FC Barcelona: Ter Stegen; Semedo, Piqué, Lenglet (Vermaelen, 77′), Jordi Alba; Rakitic, Sergio Busquets (Sergi Roberto, 82′), Arturo Vidal (Arthur, 57′); Messi, Luis Suárez & Coutinho. Goals: 0-1, Semedo (M.9); 0-2, Messi (M.68). Cautions: Bernardo (29′), Lenglet (31′), Arturo Vidal (37′), Busquets (43′), Bernardo (51′), Bono (51′), Juanpe (68′). Next PostBarça demolish Sevilla 6-1 to advance to Copa Semi-Finals.